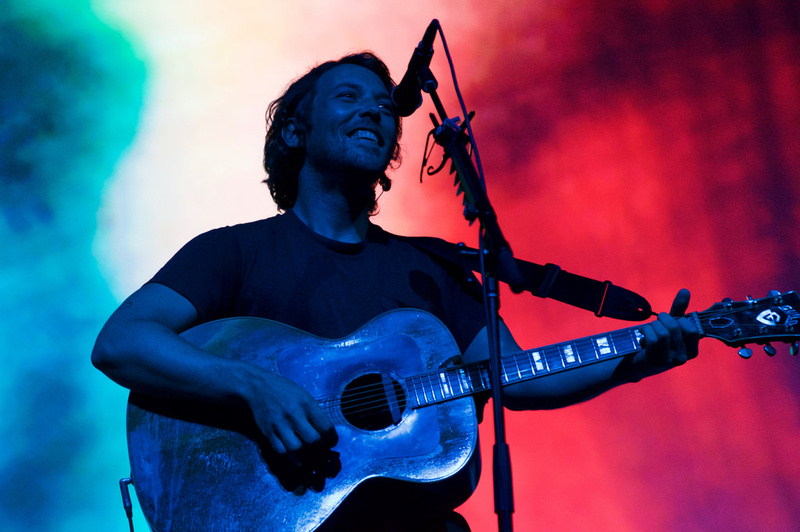 Indie folk royalty, Fleet Foxes, put on a majestic marathon of a show on Tuesday evening at The Midland. Following a three year hiatus, the band just released its third album, "Crack-Up," to critical acclaim. Fans were completely ecstatic to be witnessing nearly two straight hours of sweeping folk melodies and baroque pop harmonies. The band played in front of a massive projection screen displaying a moody, water color screensaver that shifted with each song. After a full 90 minutes of full band action (heavy on thew new album and the massive "Helplessness Blues"), guitarist and vocalist Robin Pecknold jammed a few tracks alone -- occasionally altering the songs' original cadences -- before a final movement with the rest of the group and a standing ovation from the audience. Fleet Foxes diehards in the room may not agree, but the performance put forth by opening act (Sandy) Alex G may have surpassed the evening's headliners. Philadelphia-based (Sandy) Alex G last played Kansas City in the final month of the original recordBar location. Since then, Alex's new album, "Rocket," has been released, featuring his most eclectic material yet. He's also been featured on Frank Ocean's new albums and performed at festivals with him -- no big deal. The bedroom style alt-country of "Bobby" could have been what led the band to be picked for this tour. Despite only being allotted half an hour, Alex and his band played the most dynamic set possible. Avant-garde elements weren't hard to spot -- the entirety of "Horse" consists of a strange loop. Another song's off-the-wall time signatures and drum patterns threw off many attendees. Alex spent most of the set in a nearly pop-punk power stance with his guitar, but after about 20 minutes made his way through his messy bedroom stage setup to a keyboard. One of the final songs of the set was "Guilty" -- a song containing smooth jazz sensibilities, but also possessing larger than life pop melodies. Alex's fingers danced across the keys and Kansas City received an intimate look at a genius songwriter.